The world’s premier blues festival is the Chicago Blues Festival. The free festival, now in its 32nd year, took place on June 12-14, 2015 in Grant Park, located along Lake Michigan in downtown Chicago. There was a strong national and international presence, as many fans, musicians, and the media came from throughout the U.S. and from other countries. This year’s festival hosted many of the best third, fourth, and fifth generation blues performers, some of whom were the children or grandchildren of blues legends and who have are now making their own significant contributions to the Blues music genre. As always, the festival honors the greats of the past while introducing us to the greats of today and tomorrow. Many musicians who play classic Chicago Blues were in attendance. 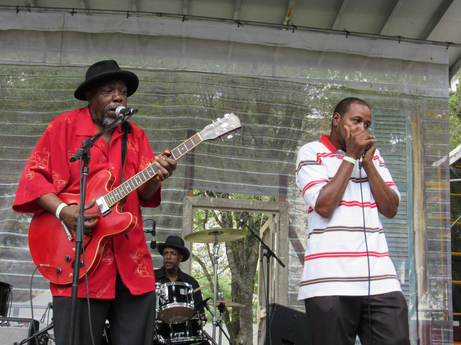 Saturday’s line-up at the Front Porch Stage included guitarist Lurrie Bell, son of legendary harmonica player Carey Bell, who had a long and successful solo career and who recorded and toured with Muddy Waters. 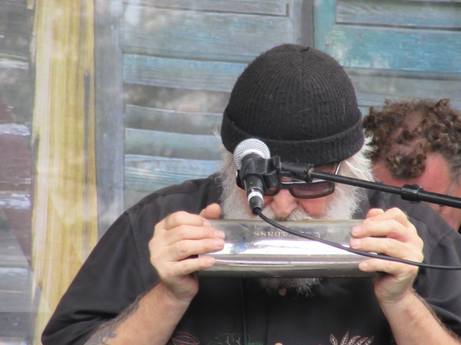 Lurrie’s brother, Steve Bell Harrington, made a guest appearance and played harmonica for several songs. Lurrie’s band is a “who’s who” of accomplished musicians, including drummer Willie “The Touch” Hayes (formerly of numerous bands, including Luther Allison’s band and Big Twist and the Mellow Fellows), and keyboard player Roosevelt Purifoy, who has appeared on countless recordings of various musicians. Guitarist Shawn Holt, also followed in the footsteps of his father, Magic Slim, as he played an intense, high-energy set with the award-winning Teardrops at the Crossroads Stage. On Sunday, at the same stage, internationally renowned Wisconsin-based multi-instrumentalist Billy Flynn played harmonica as a guest for several songs with the sultry and soulful singer, Felicia Fields, who recently spent eight weeks in Milwaukee as part of the Milwaukee Repertory Theater’s cast of Low Down Dirty Blues. Guitarist Toronzo Cannon, excited about having just signed a contract with Alligator Records, kicked off Saturday evening’s lineup at the Petrillo Music Shell with a set that gave him a good introduction to a wider audience and that should put him near the top of anyone’s “up and comers” list. Then, singer Shemekia Copeland, daughter of guitarist Johnny ‘Clyde’ Copeland, put on a captivating show that helped distract any festival goers concerned about the lightning that appeared over the Chicago skyline. Shortly after Shemekia’s set, heavy rain started and didn’t let-up; and, while I was slipping out (soaked), Buddy Guy was slipping in. The next day, accomplished music photographer Paul Natkin informed me that, as I expected, Buddy put on a great show. 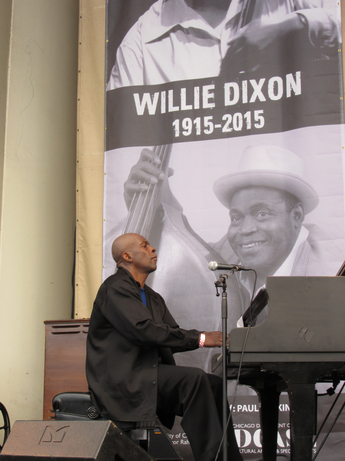 Closing out the festival on Sunday night at the Petrillo Music Shell were the centennial tributes to Willie Dixon and Muddy Waters. Billy Branch and the Sons of Blues appeared first, and harmonica player Billy Branch did double duty as he left the stage only long enough to change his outfit and reappeared with members of the Dixon family for the Willie Dixon Centennial Tribute. Pianist Bobby Dixon played magnificently on a series of his father’s hits, while Willie Dixon’s granddaughter, singer Keshia Dixon, got everyone to stand up and dance as she sang, “Wang Dang Doodle” and “I’m Ready.” Keshia was joined on stage by other family members, including Freddie Dixon, Tomika Dixon, and Alex Dixon, as well as Cash McCall, Sugar Blue, John Watkins, and Andrew Blaze Thomas. Particularly special was the return of Eddie C. Campbell to the stage after having suffered a stroke while he was living in Europe. Meanwhile, at the Windy City Blues Stage, Jim Liban, Milwaukee harmonica player and songwriter extraordinaire, performed with The Joel Patterson Trio. His set included songs from his new album with the trio, I Say What I Mean. The finale, the Muddy Waters’ Centennial Tribute, included Muddy’s sons, Mud Morganfield and Big Bill Morganfield, who sound just like their father, as well as musicians who had played and recorded with Muddy Waters. The all-star line-up included: guitarists Bob Margolin and John Primer; guitarist/bass player Rick Kreher; bass players Bob Stroger, and E.G. McDaniel (son of blues guitarist Floyd McDaniel, and Jazz pianist and singer Bessie Jackson); harmonica players Jerry Portnoy and Paul Oscher; pianist Barrelhouse Chuck; and drummer, Kenny “Beedy Eyes” Smith (son of Willie “Big Eyes” Smith, long-time drummer for the Muddy Waters Blues Band). Their expertise in performing Muddy Waters’ repertoire, as well as that of the other musicians mentioned, was a reminder that some of the world’s best musicians play Blues!